More direct and fast version of Skyline rubber. More speed and power allows to play aggressive topspins near the table or from medium distance without loosing control when playing short game or blocking. Surface – Gripy. Sponge – Hard. Strategy – ALL-OFF. Good classic Chinese rubber with hard sponge. I like the feeling and control of this rubber. For me it’s very similar to Hurricane 3, however feels a bit faster and with a higher throw. I can do with this rubber everything that I used to do with Hurricane 3. I don’t like it for BH, however it’s great for FH. I`m using it for FH which is unusual but I like the high control factor + incredible Spin. Thats my FH Play. It is medium tacky and perfect for Loop Shots from medium distance. This has good, gripy/sticky surface comparable to Hurricane 3 Neo. Speed is not fast as described in its product description. 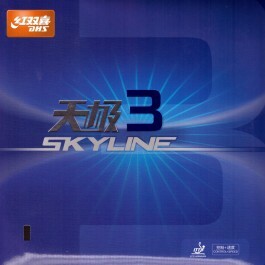 Skyline 3-Medium Hardness has better speed. Works well for me for backhand. Good for backhand. Have great control and speed. I like my racket to have an ESP and a Chinese rubber side. It provides me much flexibility in my shots. 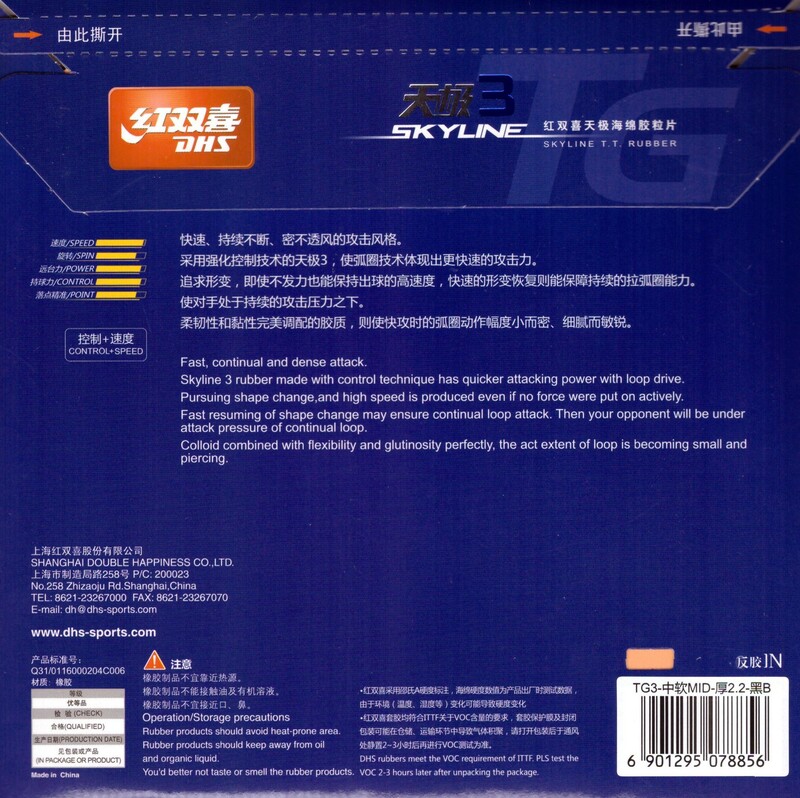 I have Skyline TG3 in 1.8 sponge and TT11 is one of a few places that have it. This is my first use of DHS Skyline TG3 and when I read that it was designed for penhold (I am a shakehold), I thought I make a mistake selecting it. I was wrong, very wrong. I have this (DHS Skyline TG3 1.8 in Red) on my Stiga Intensity as a FH (BH receiving) and Andro Roxon 450 (black) on the BH ((FH serves). I'll twiddle after serving/receiving. On serve receiving, the harder TG3 allows me to better drop the ball over the net short. Flicking is harder as it requires more wrist turning to keep the ball on the table (but possible). In looping, I'll have a full swing and be able to topspin back, regardless of the spin my opponent gives to me. It counters the topspin of my opponent very good with a low throw. If I have a faster swing, my ball travels faster (very linear). Also my shot placement is very close to where I wanted the ball to go. Conclusion: TG3 on my FH allows me to put much spin and better shot placement than prior ESN rubbers. If you twiddle the paddle and use it BH on service receiving, it allows excellent short drop shots. I can also change the pace of the rally due to the TG3 rubber. category is slowing down the ball to change the pace. You also get what you put into the shot swing, a faster brush will produce a faster shot. This can be a versatile rubber for your blade. Why DHS doesn't produce more with the 1.8 sponge I cannot understand. I really enjoy forehand looping with this rubber. I think Skyline 3 and Hurricane 3 are the best DHS rubbers for forehand loops. They are both pretty similar. The only difference is that I feel like there's more control with Skyline 3, even when I put it on a harder faster blade. It's tacky, medium hard, and not too heavy. I feel it's just right for me. Highly recommend if you like Chinese rubber. This is a typical hard Chinese tacky rubber. It's not too bouncy, and easily controllable when used on an all or off- blade. It's great for beginners to practice strokes and spins. It also produces a lot of spins because of the tackiness and good dwell time. Just beware of its low throw angle. I prefer rubbers with low throw angle on my forehand, but not everyone likes that. For the price, I highly recommand it to anyone, especially beginners and defensive players. good rubber, for my backup blade ! DHS has some fine products. This is an example of such. Exceeds worth for its price. Most of my game comes short and spinny so the opponent has to reach for the ball near the net always,then I do a short long combo game and always throws off my opponent. Not extremely spinny but I'm satisfied with its spin. Control is great. My technique needed a little adjustment with its very low arc bounce. Excellent for serves and close-midway returns from the table. No boost needed. The discount on price encouraged me to place an order for the DHS Skyline 3 but unfortunately a small split on the edge of the black rubber, after just 3 weeks use, left me wondering whether this could be old stock. I use this rubber oh FH. Very satisfied. Completely as described. Spiny and has a lot of control and I recommend this for F/H. Good price. Decent rubber for attacking with lots of spin. This rubber has excellent spin and control but is not in anyway as fast as it is claimed. Personally this is ok as it is actually very good for blocking and surprisingly for heavy chops which is what I wanted but unless it is treated in some way will dissappoint offensive players due to the lack of speed. 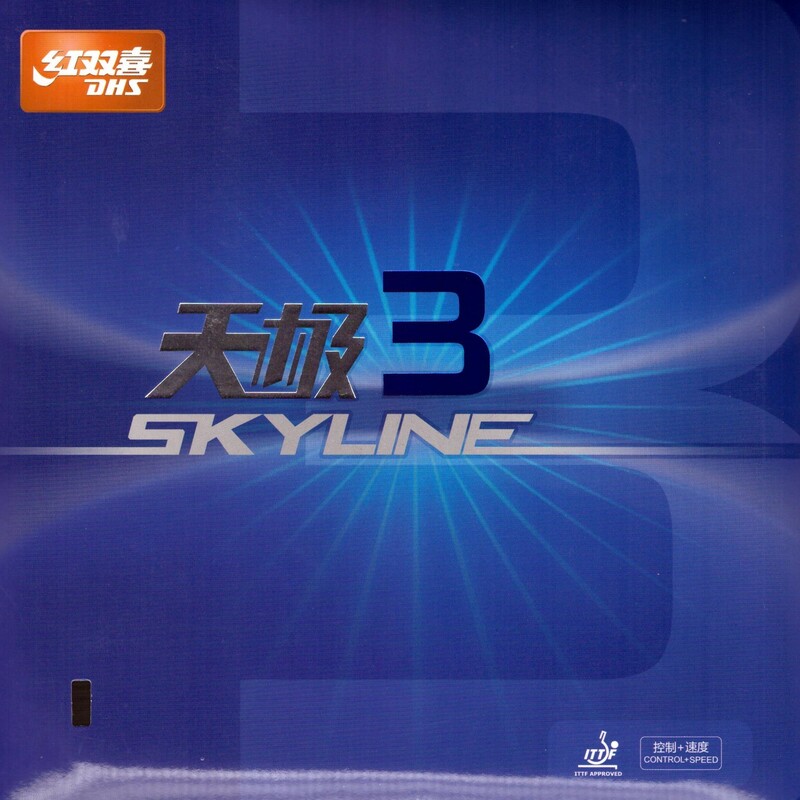 Honestly I did not find it to be much different than Skyline2 which has very similar playing characteristics. Not adjusted to this rubber yet, coming from a tacky user. This rubber is grippy, and hard. Great at looping high speeds, and driving, a bit slower for blocking. Spin doesn't seem to be as high as say the H3, but it's definitely much faster. Good speed, and control close to the table. lots of gears, tacky, not really heavy (only 42g for a 2.2mm rubber after cutting to 157x150 size). I think the one with Neo sponse is heavier. not for lazy players - can be very fast and super slow. rubber has good feel and touch - I prefer Skyline rubber to Hurricane rubber although both are good rubbers and value for money. Tabletennis11 is the only place I have found which has this rubbers in 1.5mm and 1.8mm. It is hard to source good Chinese rubbers at 1.5 to 1.8mm sizing as most Chinese rubbers are 2.15 to 2.2mm thick and heavy. The site TT11 is always very responsive in sending.